A basic PowerPoint presentation, a brochure about LiU and campus maps are all now available with the new graphic identity. The material exists both in Swedish and English. The previous pocket fact brochure from 2014 should no longer be used, as a lot of information in it is out-of-date. 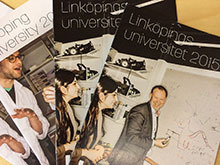 The previous larger brochure (Linköpings universitet – En förnyare av utbildning och forskning/Linköping University – Innovator in Education and Research) may still be used until the end of the year if more text than the new brochure contains is wanted. However, no more copies of this will be printed.